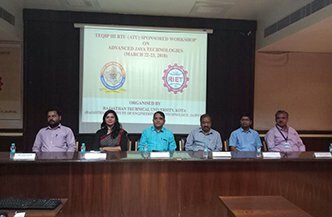 The Rajasthan Institute of Engineering & Technology organized a two day event the-“TEQIP-III (RTU) (ATU) sponsored workshop” on advanced JAVA technologies in association with RTU-KOTA. The programme was initiated on 22.3.2018. The programme was graced by Honorable Vice Chancellor RTU, Prof. N P Kaushik, Pro.V .C. RTU Dr Rajeev Gupta, Dr Harish Sharma, Associate Professor, and Nodal Officer, TEQIP- RTU, Dr. Saroj Hiranwal, Principal, RIET, Prof. Kapil Dev Sharma, Dean Academics & Admin, Prof. Sachin Sharma, Vice Principal, RIET, along with all the respective HODs Faculty members and students who participated in the event. The three resource persons who will impart training on the occasion are Dr Sanjay Jain, Associate Professor, Amity University, Jaipur, Ms Gargi Saxena, Android Developer, PTPL, Jaipur, Ms Ayushi Kothwal, Sr Developer and Corporate Trainer, Priganik Training and Research Centre. Speaking on the occasion Honorable Vice Chancellor RTU, Prof. N P Kaushik, said that it is very nice to see all the participants (students and faculty members) taking interest in this event. He particularly mentioned the name of Mr Imran Khan, who is a Maths Teacher in Alwar, who has had very basic education and later enhanced himself in the field of teaching. Mr Khan has developed 75 android aps all related to educational uses. All these aps are being used by various students and teaching staffs. He added that if a person has determination to work, he/she can do it easily. Pro.V .C. RTU Dr Rajeev Gupta, also acknowledged the gathering and said that the TEQIP-III is a great help in Improving quality and equity in engineering institutions in the focus states. This will also help System-level initiatives to strengthen sector governance and performance which include widening the scope of Affiliating Technical Universities (ATUs) to improve their policy, academic and management practices towards the affiliated institutions, and linking arrangements to Build Capacity and Improve Performance of institutions and ATUs participating in focus states. Dr Harish Sharma, Associate Professor, and Nodal Officer, TEQIP- RTU said that only the Government and Government aided AICTE approved Engineering institutions will be the part of this project. 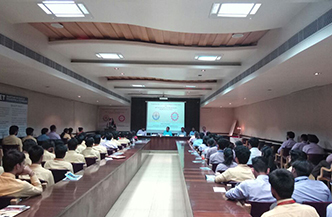 The students and faculty members of the various institutions will be highly benefited by this project. It was also known that an estimated 200 Government and Government funded Engineering institutions including Affiliating Technical Universities (ATUs) will be selected under different sub-components in one or two cycles. 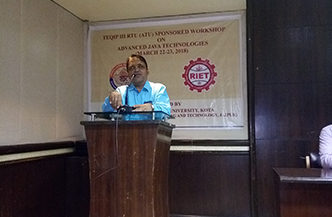 Prof. Kapil Dev Sharma, Dean Academics & Admin, RIET, said that RIET is indeed fortunate to host this programme and it is definite that the organization will be highly benefited by this programme. Prof Sachin Sharma, Vice Principal, RIET, expressed his gratitude to all the dignitaries for giving their valuable time and being a part of this prestigious event. On day 1 (22/3/18) session 1 was taken by Ms. Gargi Saxenea from PTPL, Jaipur where she revisited the contents of core java ,delivered breadth knowledge of Java EE web Application and it’s working , Web Application Structure, Servlet and Dynamic content, Advantage of Servlet, Life Cycle of a Servlet with some hands on experiments. 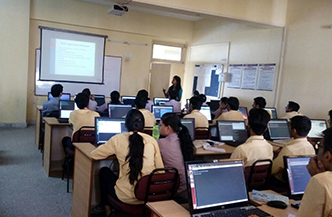 Session 2 was taken by Ms. Arushi Kothiwal, PTPL, Jaipur where she explained and gave hands on training on declaring and mapping servlets, request dispatching and response redirection, static and dynamic web pages. Day 2 , 23/3/2018, Session 1 was taken by Mr._____________ , where he explained Shortcoming of Servlets , how to overcome the shortcomings through JSP, JSP Life Cycle ,Elements ,Directives, Scripting Elements and Built-in Action Elements. 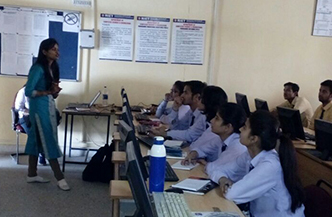 Session 2 was taken by Ms. Arushi Kothiwal , where she provided hand on training on how to handle database with JDBC. This workshop was systematized in RIET by Ms. Shikha Choudhary, Associate Professor & TEQIP coordinator, RIET. Speaking on the occasion she said that over 65 candidates have participated in this event, of UG & PG levels, which include various students and faculty members as well. Valedictory session was conducted to ask about the feedback of the workshop from the participants and certificate to experts as well as participants were given.